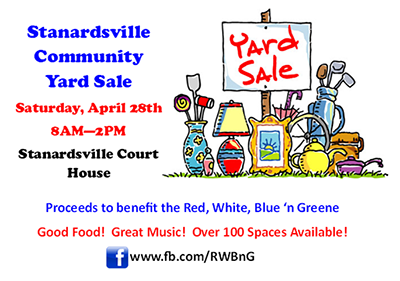 The Stanardsville Independence Day Committee is holding a community yard sale on Saturday, April 28th from 8AM-2PM to help raise funds for the Red, White, Blue ‘n Greene event. Spaces are $25/space and over 100 spaces are available. Enjoy great music, good food, children’s games and more at this very special event. Stanardsville United Methodist Church will be selling a continental breakfast and lunch to raise money for GRACE—Greene Alliance of Church/Community Efforts, a local non-profit which helps individuals and families with immediate or long-term needs. ► Click here to sign-up online!